The picture really has nothing to do with the post. Luna moths are beautiful, so why not have a picture of one? I’ve recently been thinking about dreams and goals. Having realistic goals and dreams is essential to a successful life because they give you something to work towards. My dreams/goals are the reason I get up in the morning. There’s nothing like the feeling of accomplishment you get when you achieve even the smallest piece of a goal- because you’re one step closer to your dream. But is it ever OK to give up on a dream? Maybe years and years have passed and you begin to realize that your dream may no longer be realistic. Maybe life circumstances change and your goals simply cannot be met. Like setting goals, giving up on goals should also require a lot of thought. Instead of giving up completely, maybe there’s a way to change the path by which you arrive at your goal. Like if you want to write a novel and all of a sudden you’re in a car accident and lose the use of both your hands. You may not be able to physically type or write, but there is voice recognition software out there that will allow you to literally tell your story. The goal has not changed; it’s just that the way to get there has changed. I read somewhere (and as always, I can never recall where) that sometimes it’s OK to give up. Sometimes it’s healthy to give up – otherwise you’ll just be beating your head against the wall trying to achieve something that’s impossible. Intuition should be your guide when you’re facing these types of dilemmas. Intuition ought to let you know what’s going right and what can’t possibly work anymore. I believe that every person was blessed with different talents and skills that will enable them to reach a goal or dream. If one dream doesn’t work out or is no longer realistic, then there a multitude of other paths we can take. It requires a bit of creativity and flexibility, but even if we have to totally give up one dream, we can begin to work towards another. There is never a time in life when we are utterly devoid of something to work towards – we just have to find something. Oh, I think you can give up on a dream. There are times when it’s healthy. When I was 22 I fell in love with a girl. We had a short relationship. She broke it off. I remained devoted to her (I had other girlfriends, but part of me was still stuck on J. (I’ll call her that). She resisted (she told me later that she found my devotion good for her always-shaky self-confidence) and we ended up with a weird relationship where we almost never saw each other but we talked on the phone for an hour or two every night (that’s what people did before IM). She slept with a couple of my friends. I had other girlfriends. One of whom I married. Then J. freaked out because she realized that the constant devotion was over. Anyway, it goes on from there. It never got ugly (no infidelity or anything), but eventually we both had to realize that we had to give up on ever ending up together. So, I turned her into a fictional character. As Hemingway learned, you end up thinking about the fictional version more than the real. He said in later years that he had trouble remembering Lady Duff Twysden because when he thought about her he ended up thinking about Lady Brett Ashley, the character he had created in The Sun Also Rises. I also gave up on ever being a successful professional musician, which left a lot more time and energy for writing. Two of the characters in my first novel are based on the same ex (not the one mentioned above, she only got one character). Another ex was a main character in my WIP, but so far she appears to have been left out of the new draft. Too bad, she’s a lot of fun, but (following your advice here: http://maasmith7.wordpress.com/2011/07/20/combining-characters/) there was too much overlap with another character. I will have to do something with her at some point. Combining can sometimes be painful, but characters can always be recycled. I believe that dreaming and having a specific goal are necessary to lead a full and productive life. It makes it easier to plan your day and push forward to creatively overcome obstacles. That’s my mentality – that’s why I keep on pushing to get to my goals, within reason of course! How do you know whether to “keep on keeping on”? Look deep. The answers lie within. 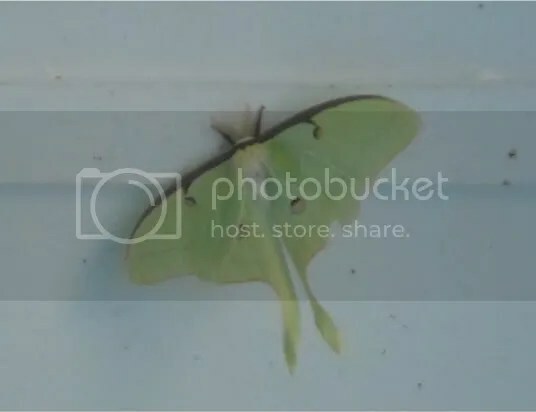 Luna moths also signify rebirth and new beginnings as they represent a continuing quest for truth and knowledge, gift of intuition, psychic perception and heightened awareness. I suppose these things are associated with “seeing the light” since the luna moth is nocturnal but will gravitate toward light in the night. Hmm… maybe it’s a sign! I’m thinking about this as it applies to writing for me. It’s a dream of mine to be a published author, but the goals (writing and revising and finishing stories and poems) are worthwhile in and of themselves. So maybe the dream will never be realized, but if I can keep making time to write and meet goals of completing projects, that will be enough. I don’t know how it is for everyone, and for different types of dreams…do you think it’s the same? Exactly. That’s why I don’t really care whether or not I get published – just the act of writing and finishing something is good enough for me. I think it might be the same for other dreams – like being a professional athlete or musician; just as long as you can play your game or write songs or play your instrument is an accomplishment – whether or not you “make it” big time. I think it’s important to have dreams but yes they can change or you can grow up or move on and they develop with you. I guess you have to give it your best shot and see where the road takes you! “See where the road takes you” – I like that! Yay for voice recognition, without it I wouldn’t be able to tell half my stories. There is always a path to our dreams just because one path maybe longer does not make it less worthy of travel. The longer the path, the more the reward becomes worth the struggle.